I keep lists of restaurants for just about any town I might conceivably visit. I don't get to do nearly as much culinary tourism as I'd like, but it's always good to be prepared. Drop me in just about any major city - several minor ones too - and in fifteen minutes I'll find a good meal. When I get to the point of actually planning a trip, the list gets even more detailed. 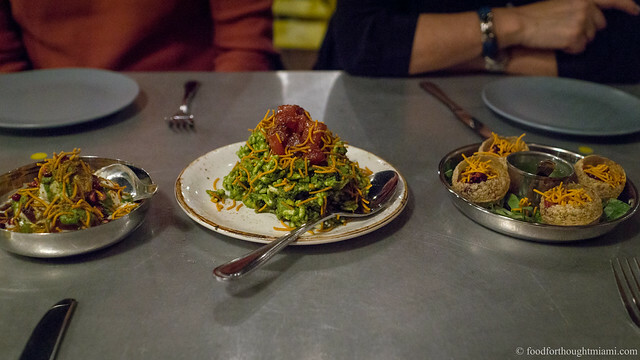 For a true dining mecca like San Francisco, which we've visited several times, the difficulty is not in coming up with the list but in paring it down. There are the old favorites, there are the well-known places we've still not yet gotten to, and then there are the waves of intriguing newcomers, and the challenge is figuring out what to squeeze into the limited dining opportunities. On this particular visit, the paring down process is made both easier and harder by a couple factors. First, we've got very limited time in San Francisco, only three real dinners, in fact, as we're only in town on brief stopovers on our way to and from Hawaii. Second, this is a family trip, and I've learned from painful experience not to test their dining patience too much. I've been rationed to one tasting menu, and it's already spoken for - we've got spots at a Lazy Bear underground dinner one night, so it'll be a la carte for us the rest of the trip. That immediately eliminates a lot of the San Francisco restaurants that would otherwise be high on my list: Saison, Benu, Atelier Crenn, Sons & Daughters. So what I'm looking for, if it makes any sense (and it does to me, anyway), is tasting menu style food, but without the tasting menu format. As I often do, I run my thoughts through Chowhound, where the Bay Area board has often steered me well. 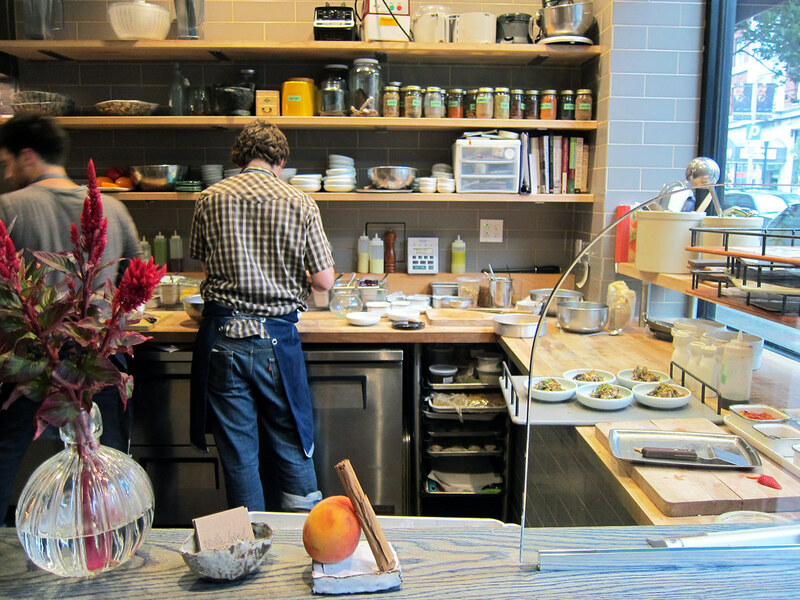 Of what's left on the list, one name keeps jumping out at me: State Bird Provisions. I'm not sure where I've heard of it, I've not read much about it, but the idea certainly intrigues: dim sum style service, pushcarts and all, but it's not Chinese food, just an eclectically assembled choice of small plates. It sounds just about perfect for our first night in town, as everyone recovers after a six hour flight. It turns out to be exactly what I was looking for and then some. In a location adjacent to Japantown, an open kitchen hums, carts roll, and colorful little dishes pile up on the tables. 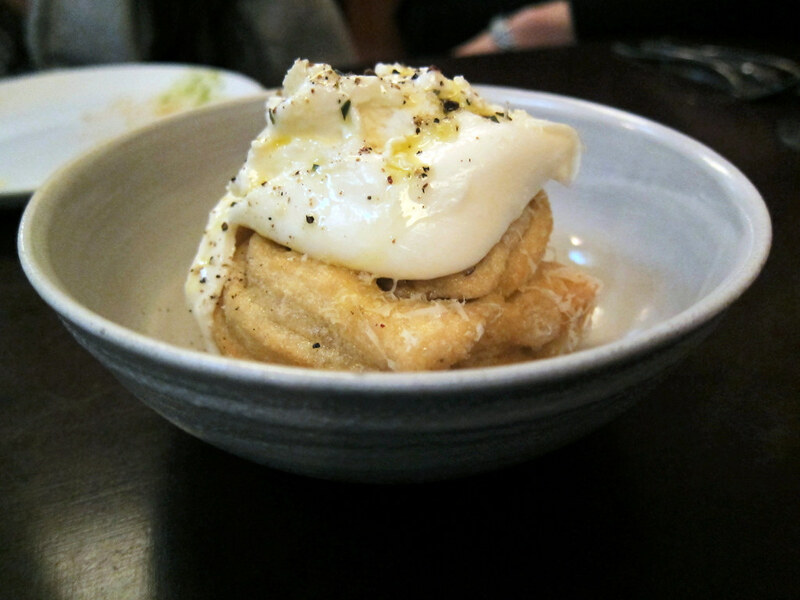 But the food is geographically untethered: tofu is paired with Calabrian chiles and pesto; that doughy thing may look a bit like a char siu bao, but it's garlic bread topped with burrata cheese. And this is all no mere gimmick - eating at State Bird is fun, but the food is equally creative, thoughtful, and just flat out delicious. 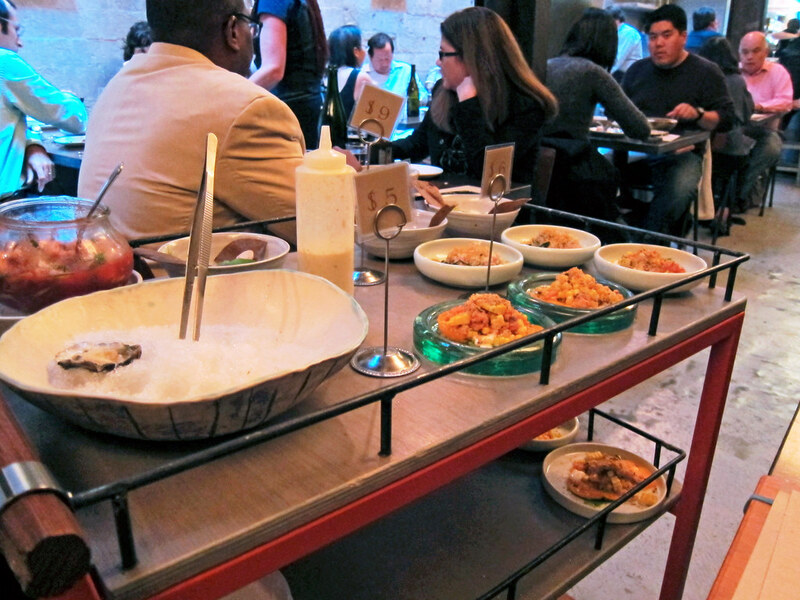 Like any good dim sum parlor, the carts start coming by the table almost immediately after you've been seated, though here they're preceded by a brief explanation of the service method and drink orders (txakoli for the grown-ups, house-made fruit sodas for the kids). The carts set a perfect pace, with shareable dishes hitting the table every few minutes, rounded out by a few larger "Commandables" that can be ordered off the menu. 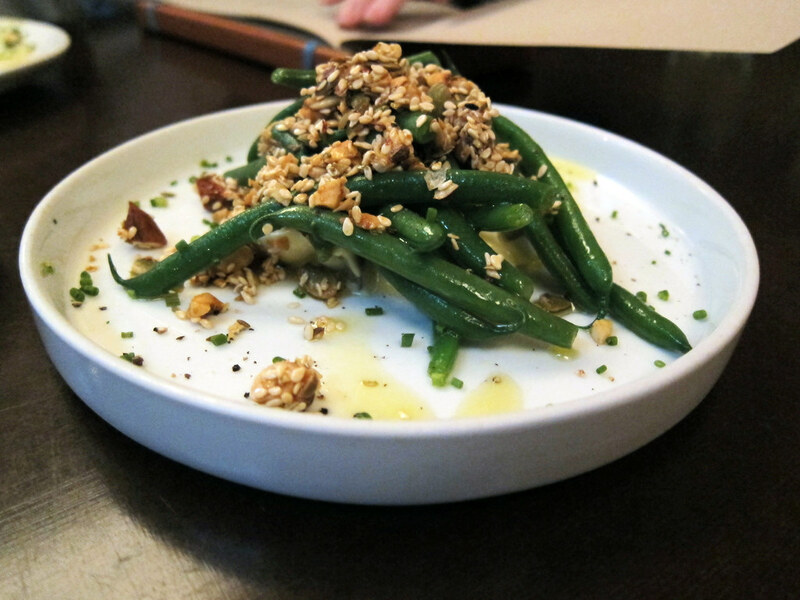 Green beans, snappy and fresh, are served over a rich, creamy egg salad, with a scatter of snipped chives and a crunchy, salty brittle of of nuts and seeds. It's the brittle that really elevates this dish, a great trick I'm already thinking about how to incorporate into my own cooking. 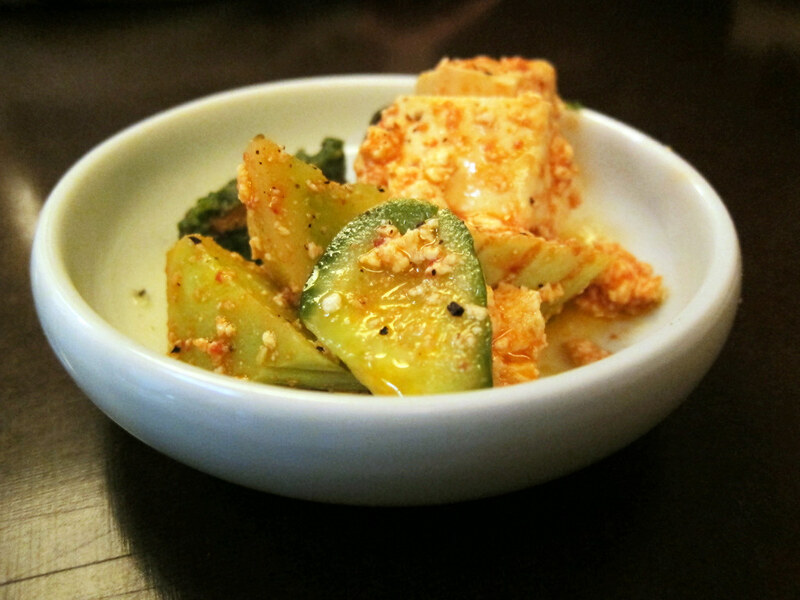 Cubes of tofu are rubbed with Calabrian chiles, served with salted cucumber wedges and a thick green pesto. It's a wonderful, bright combination of flavors and textures, the kind of dish that keeps giving you reason to come back for another bite. A twisted knob of chewy, toasty dough, saturated with olive oil and garlic, and draped with oozy, creamy burrata, is like garlic bread squared. 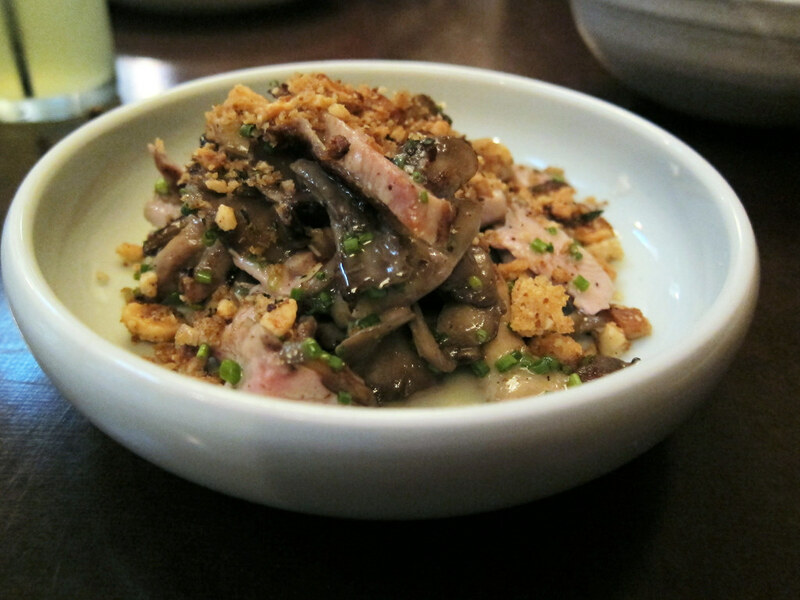 Breast of quail, the namesake "state bird" of California, is slivered and tossed with sautéed matsutake mushrooms, preserved lemon and crispy bread crumbs, the mushrooms adding earthy depth, the lemon sunny brightness. Said state bird in another form is listed as a "commandable" on the menu, the whole bird fried to order. 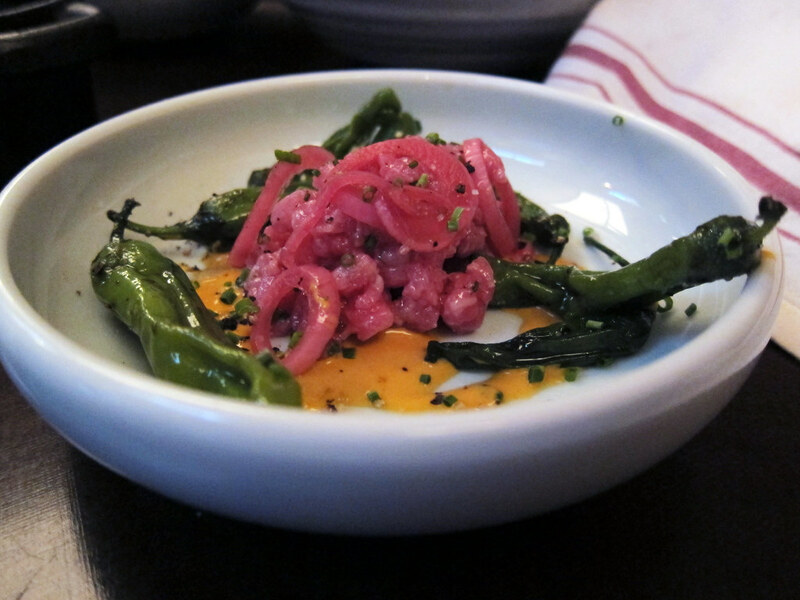 Steak tartare is enlivened with a ruddy aioli, wilted shishito peppers, and garnet-hued pickled onions. 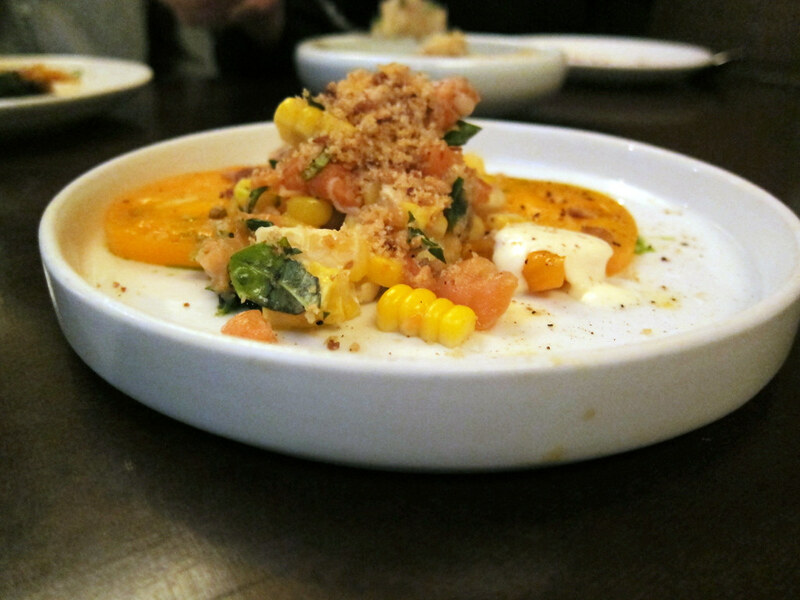 Smoked salmon, with golden tomatoes and corn, is one of the few dishes that fails to make much of an impression - tasting unmistakably of summer, but lacking the same pop as most of the other things we tried. 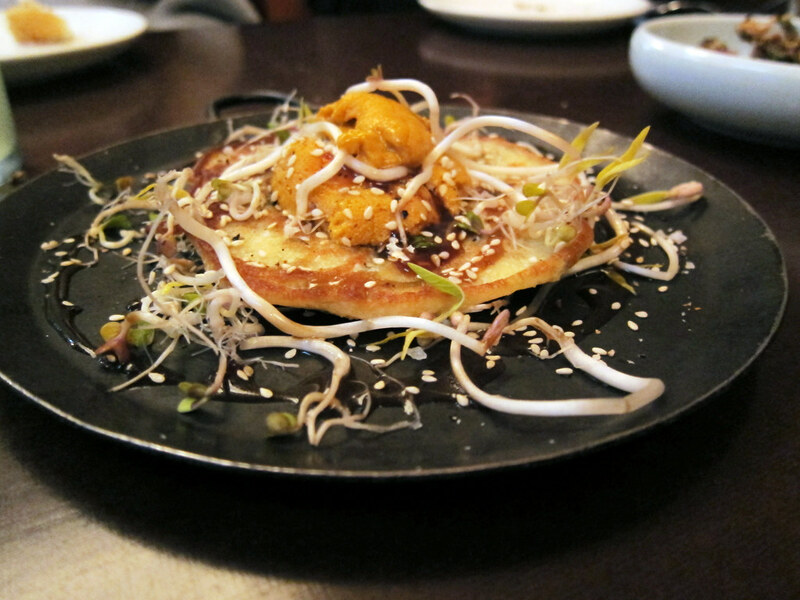 Items that can be ordered off the menu also include a small assortment of "pancakes," like this fantastic combination of a ginger-scallion pancake topped with lobes of uni, fresh bean sprouts, sesame seeds, and a drizzle of a soy-lime reduction, one of the best bites among many. It's a great example of how State Bird's food manages to be careful and thoughtful without being precious and fussy. 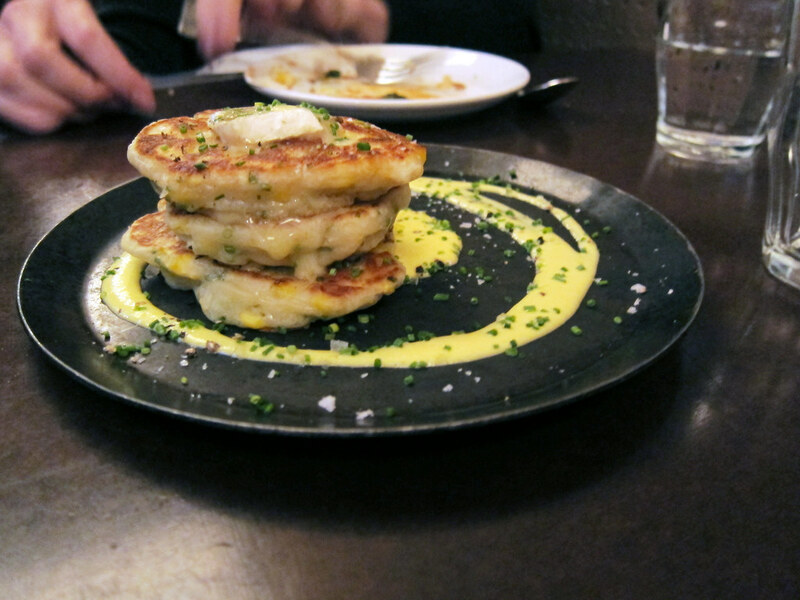 A "short stack" of sweet corn and garlic chive pancakes, plated with a silky corn purée and dripping with melting Mt. Tam cheese, a rich triple-cream from Cowgirl Creamery in nearby Point Reyes, is another great pancake offering. 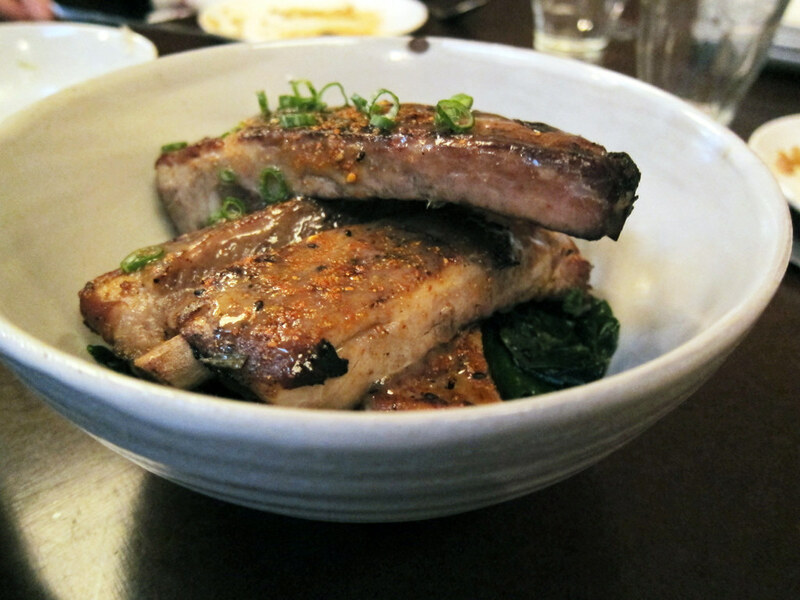 A few heartier options can help round out a meal: burnished cubes of pork belly with pungent kimchi and fresh thumbelina carrots; pork fried farro with a soft egg and pickled vegetables (simple genius, this); and from the "commandables," togarishi-sprinkled pork ribs over a bed of wilted spigarello, a leafy green similar to broccoli rabe. Prices for the cart items range from $5 to $9, and a good variety of them make their way around the room during the course of a dinner service - our choices represent probably only half of what's on offer the night of our visit. And from my regular spying on the website, both before and after our visit, the dishes seem to change often. 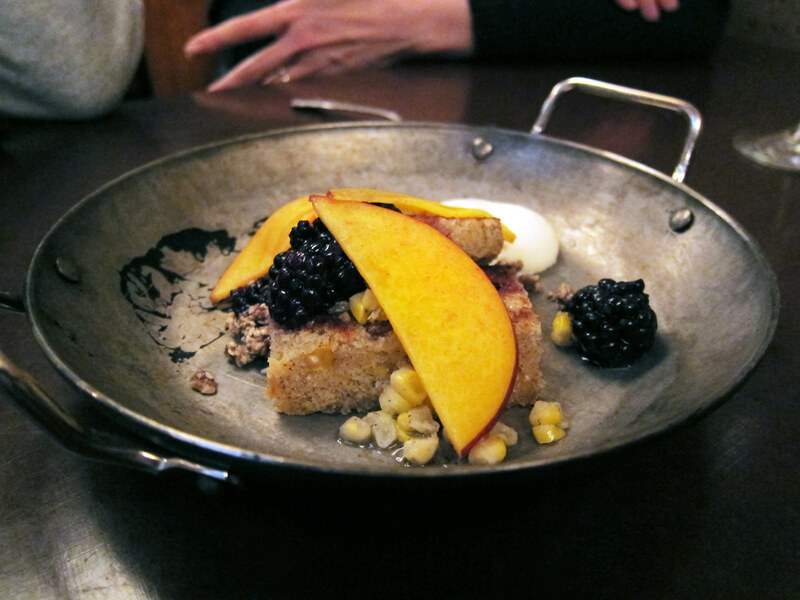 For dessert, we have a sweet corn cake, garnished with tender slices of nectarine, plump blackberries, kernels of sweet corn, and a peach leaf cream. But also not to be missed are the shots of peanut-steeped milk sweetened with muscovado sugar - dubbed "World Peace" on the menu, $2 is a small price to pay. After our visit, I piece together some of the backstory on State Bird. 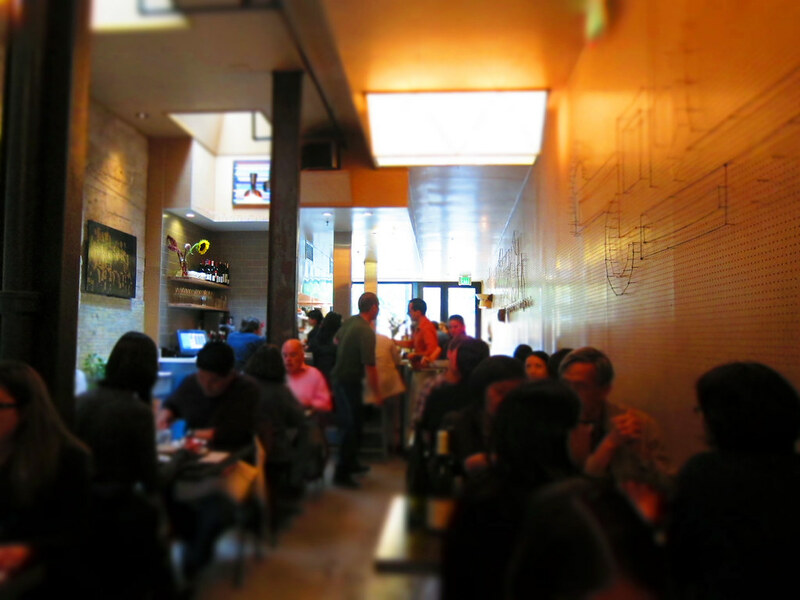 It's run by husband and wife chef team, Stuart Brioza and Nicole Krasinski, well known to San Franciscans for their work at the now-closed Rubicon, a restaurant at the root of the family tree of many of the city's great talents. The Rubicon connection also probably explains why I saw its former owner, Drew Nieporent, in the State Bird dining room during our visit, even if I initially mistook him for Francis Ford Coppola (I'm apparently not the only one to confuse them). There's no question that the dim sum style cart service adds to the appeal of State Bird. There is something immensely appealing about being able to eyeball a dish before you eat it, especially if it's as vibrant and colorful as those circulating around the State Bird dining room (to say nothing of having food hit the table within minutes after you're seated). But this would all just be a clever "concept" if it didn't taste so good. 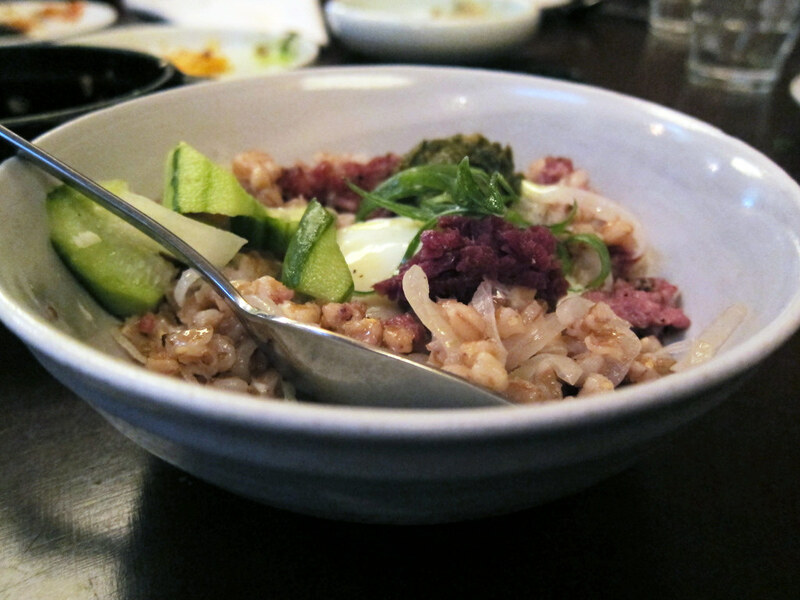 Served any way, State Bird's food would gratify - full of unexpected but unforced combinations of ingredients, and clever interplays of textures. 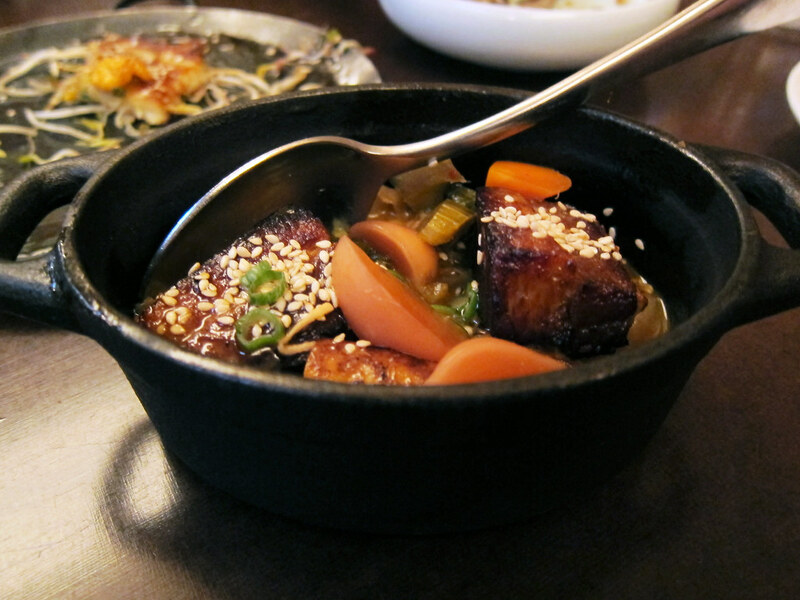 It was one of the most pleasing and fun meals I've had all year. I was looking for tasting menu food, served a la carte. I found something even better. A few days after our visit, State Bird was named Bon Appétit's "Restaurant of the Year" in its list of America's Best New Restaurants. It's going to stay on my list too.